Chipotle stock has surged 20% in the last month and a half. Can it keep rising? Shares of Chipotle Mexican Grill (NYSE:CMG) kept pace with the broader market for the first few months of the year but plummeted in April, in part because of investors' fears about falling profit margins. As I argued at the time, the pullback in Chipotle stock didn't make much sense. After all, the company reported outstanding 13.4% comparable-store sales growth in Q1 and announced plans to raise prices on the Q1 earnings call. In the past month and a half, Chipotle stock has surged back in front of the S&P 500, rising more than 20% from its late-April low. 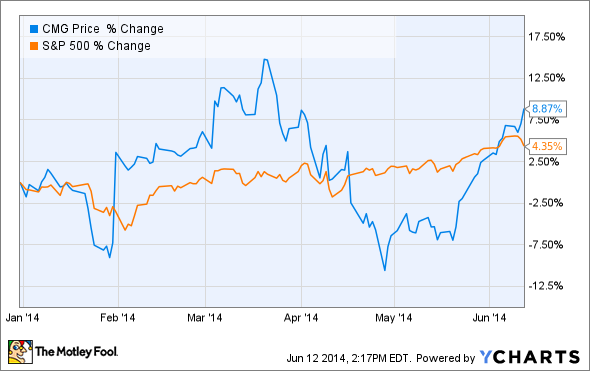 Despite its big run since late April, Chipotle stock has plenty of long-term upside. Investors are finally reconsidering their initial paranoia and now seem to recognize that Chipotle has enough pricing power to maintain or even grow its profit margin. Moreover, at just a fraction the size of global fast-food giant McDonald's (NYSE:MCD), Chipotle has massive growth potential. Last quarter, Chipotle's pre-tax profit margin declined by 1.5 percentage points. The key drivers of this margin decline were a rise in the cost of food and beverages from 33% to 34.5% of sales, and an increase in general and administrative expenses from 6.1% to 7.4% of sales. These increases were offset by savings in other areas, as Chipotle leveraged overhead and labor costs. Chipotle stock fell after the Q1 report because executives predicted that margins would drop again in Q2 because of further food cost increases, unusually high stock compensation expense, and a step-up in marketing spending. However, stock compensation will revert to a lower level in Q3, which will reduce cost pressure in the second half of 2014. In fact, Chipotle's recent price increase will lead to significant margin expansion in Q3 and beyond. Chipotle is raising prices by roughly 6% on average. The increases have already been implemented in more than 1,000 restaurants, and Chipotle has seen little to no change in customer traffic patterns. Raising menu prices adds revenue without any significant corresponding costs. It thus allows Chipotle to leverage all of its expenses. If Chipotle's Q1 revenue had been 6% higher but costs had remained constant (i.e., there had been a price increase and no change in customer behavior), the company's pre-tax margin would have been 19.9% instead of 15.1%. No wonder some Chipotle stock analysts think EPS growth could hit 40% in the second half of 2014. Chipotle's margins are virtually certain to rebound in the second half of 2014, but the company's strong growth is the real reason long-term investors can be confident about Chipotle stock. McDonald's has more than 35,000 locations worldwide, of which fewer than 15,000 are in the United States. By contrast, Chipotle has fewer than 1,700 restaurants, almost all of which are within U.S. borders. McDonald's has more than 20 times as many locations as Chipotle today. At this point, you may be protesting that McDonald's and Chipotle are completely different -- McDonald's has much lower prices so everyone can afford to eat there, while the same can't be said of Chipotle. That's why McDonald's is able to serve nearly 70 million people every day. However, while just about everyone in the U.S. can afford to eat at McDonald's, many people don't. For health or food quality reasons, tens of millions of people won't eat at McDonald's or any other fast-food joint -- except (perhaps) Chipotle. Furthermore, with a higher average check, a Chipotle restaurant doesn't need as many customers each day as a McDonald's. Most importantly, Chipotle's strong growth shows that it is nowhere near saturating the market. A recent study found that Chipotle was already No. 6 among U.S. fast-food and fast-casual chains in sales per restaurant in 2012. A little more than a year later, Chipotle has added more than 200 restaurants, yet it still grew sales per restaurant by about 5%. Chipotle has plenty of runway for unit growth. Chipotle executives have stated that in the long run, the chain could grow to at least 4,000 locations, and the recent sales trajectory makes that estimate look conservative. Chipotle is also experimenting with new store formats (small towns and malls), new concepts (ShopHouse Southeast Asian Kitchen and Pizzeria Locale), and new countries (Canada, Britain, France, and Germany). If all of these growth outlets pan out, Chipotle could eventually grow to be a chain of 20,000 or more restaurants doing over $60 billion of business annually. This is a best-case scenario, but even if some of these growth initiatives fizzle, Chipotle could easily reach 10,000 restaurants. That's 6 times more than what it operates today. This level of growth would support a much higher Chipotle stock price. Chipotle will never surpass McDonald's in size, but if both new experimental concepts succeed, it has the potential to ultimately grow to tens of thousands of restaurants. Chipotle's recent sales growth trends demonstrate conclusively that there are plenty of people willing to pay Chipotle prices for good food. It will take decades for Chipotle to reach its ultimate growth potential. In the meantime, it's generating plenty of free cash flow and growing sales per restaurant, which drives long-term margin growth. In the long run, Chipotle stock is likely to reward patient investors with huge gains.